Note: If you landed here by searching on “datasaurus” (± “dozen”) and have no idea what SenseMaker is, you can jump to the graphical results. My plan was to write another post about how an analyst or subject-matter expert might deal with such a “spectrum,” ranging between one end-member with well-defined, highly-aggregated data and another with random-looking, highly-scattered data. Surely those two poles would cover the triadic universe, right? That plan was sidetracked, however, when I recognized the possibility of aberrant cases, ones that are unlikely to arise with story data, but which might nonetheless provide some insight. So this post is about how to derive those cases and about the esoteric lessons therein. 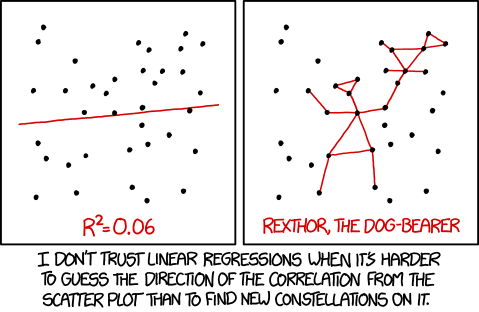 The eternal point is clear and succinct: Don’t just calculate, plot! Clarity and brevity notwithstanding, Justin Matejka and George Fitzmaurice of Autodesk Research decided to reinforce the message. 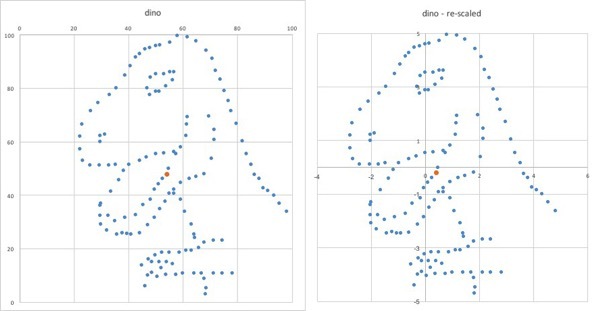 They created an additional twelve (x,y) datasets, The Datasaurus Dozen, with the same summary statistics – arithmetic means, standard deviations, and correlation coefficient, all identical to two decimal places – but visually distinct graphical patterns. There are horizontal, vertical, and diagonal parallel lines; fuzzier horizontal and vertical swaths; a grid and a blob of points; a big “X”; a five-pointed star; and single and double circles. There were no other life forms though, either extant or extinct. If you’re more of a viewer than reader, you can watch this video and then scroll down to the next heading without missing any essentials. Or you can read on, ± watching. This project is described in a research news article, Same Stats, Different Graphs. Not surprisingly for the Autodesk site, there are excellent graphics, including several animated gifs. 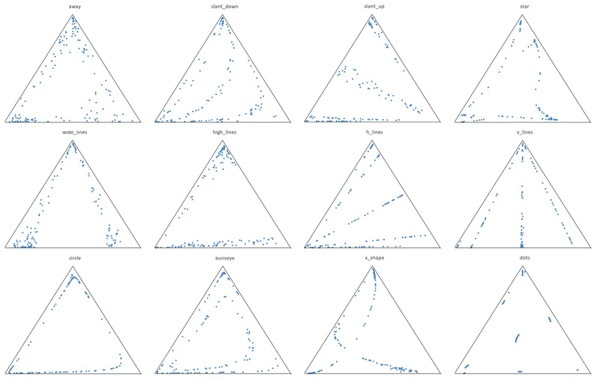 Matejka and Fitzmaurice acknowledged and augmented the ancestor to all such constructs, Anscombe’s quartet, four datasets published in 1973 by Yale statistician F.J. Anscombe, who exhorted his contemporaries with the same message: Don’t just calculate, plot! The key insight behind our approach is that while generating a dataset from scratch to have particular statistical properties is relatively difficult, it is relatively easy to take an existing dataset, modify it slightly, and maintain (nearly) the same statistical properties. 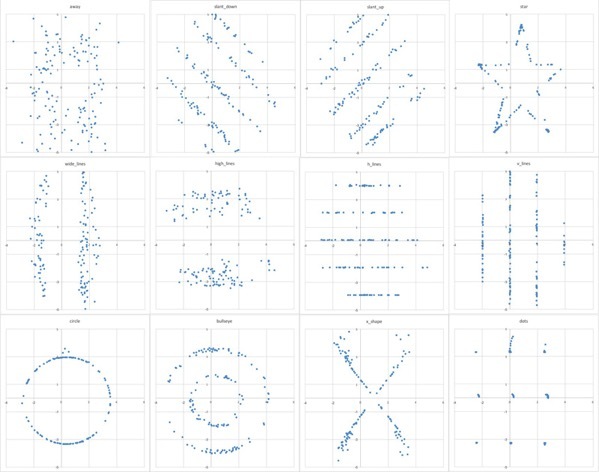 With repetition, this process creates a dataset with a different visual appearance from the original, while maintaining the same statistical properties. Further, if the modifications to the dataset are biased to move the points towards a particular goal, the resulting graph can be directed towards a particular visual appearance. The dotted green and yellow lines connect six equivalent points and clarify that the ternary Dinosaurus is facing right, that is, the vertical join between the two plots is a mirror plane of sorts. Details of the reason for a “re-scaled” plot and the construction of the triad from it are given in the Appendix. So what (is the implication for a SenseMaker project)? Mind you, I would never expect to see story dots forming even a star or a circle, let alone a dinosaur. When some other parameter, such as time or reward structure, is an independent (controlled) variable in a story-collection process, however, then unusual data structures may provide guidance in interpretation and, perhaps surprisingly, in prediction. But first a brief recap of the back-and-forth of the relevant transformations. 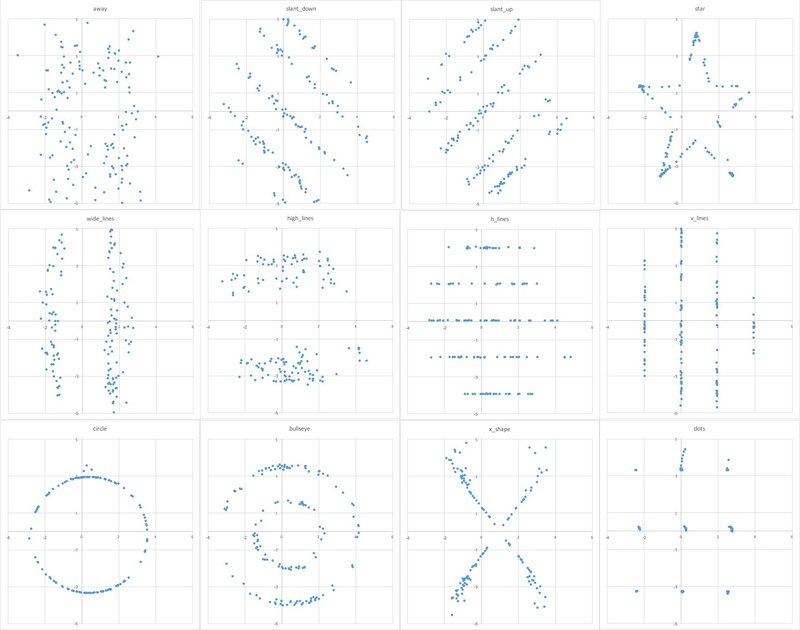 Part II: Log-Ratio Transformation in this series gave a foretaste of the relevance of looking at SenseMaker data in both ternary and rectilinear coordinates. As that post discussed, the fact that we can present summary statistics for a triad — to say nothing of more advanced metrics like kernel density estimates (see Part VIIIa) — is due to the methodology created by statistician John Aitchison (see References in Part II). In a nutshell, constant-sum ternary coordinates are transformed to open-ended (x,y) coordinates in a log-ratio space where standard statistical calculations can be performed reliably; and the results are then inverse-transformed back to the ternary. Part IV: Confidence Regions is an outcome of just such a procedure. [It] is called isometric because it allows us to associate angles and distances in the [triad] to angles and distances in [the transformed rectilinear plot], where we feel more comfortable from an intuitive point of view. This is of particular interest with respect to concepts of orthogonality. 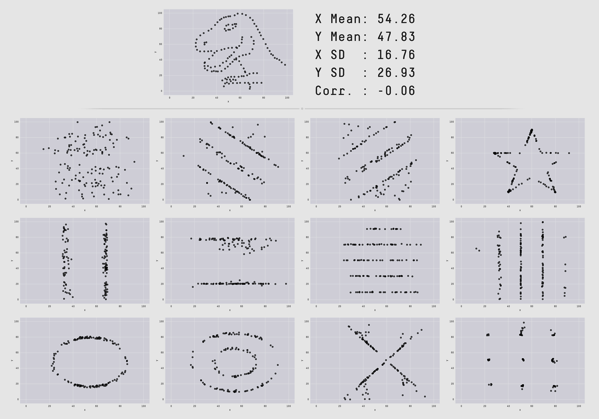 Note that The Dinosaurus Dozen pair labelled “x_shape” (3rd row, 3rd column in each panel, above) shows exactly this behavior, but for two intersecting lines , rather than two parallel ones. Egozcue et al. refer to the solid lines as “compositional processes” and cite bacterial growth, radioactive decay, and sedimentary deposition as natural examples of these patterns. In fact, as the names imply, the solid curves/lines are parametric in time, which varies independently along them, even though it does not appear as an explicit variable on any axis or vertex. In the research literature of the respective disciplines — biology, physics, geology — these processes are more likely to be shown in a log-ratio plot than a ternary. parametric in both t & T: geology, e.g., changing lava/magma composition during flow differentiation or fractional crystallization (see the example from Aitchison in Part II of this series, although it used the alr transformation, not the ilr). There are at least two categories of SenseMaker projects that could show parameterized data. Firstly, punctuated or continuous capture of stories is inherently time-parametric. There would be no guarantee that signified results would actually change over time, but looking for such change is a primary motivation for the approach. It is also a means of testing whether adjustments of extrinsic factors, including safe-to-fail experiments, had detectable effects. Don’t just calculate, plot… and then connect! The simplest approach was to use the alr transformation because it directly yields an increase from D-1 to D components (2 to 3 in this case). Additionally, my motivation was only to recover the general pattern of points, not to preserve metrical distances. Finally, I converted the re-scaled (x’,y’) data to triad coordinates by the inverse alr transformation , using the form equivalent to eqs. (4)-(6) in Part II. The image array is shown above at Graphical Results. 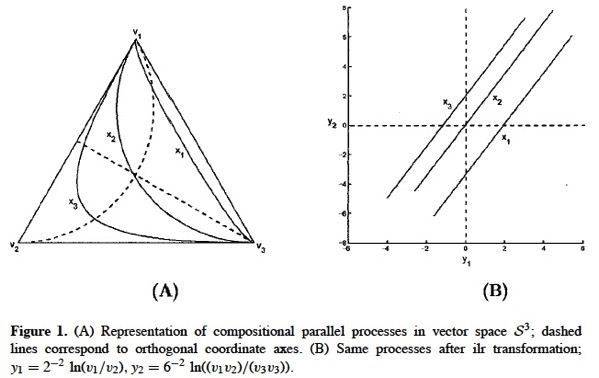 Egozcue, J.J., Pawlowsky-Glahn, V., Mateu-Figueras, G., and Barcelo-Vidal, C. (2003) Isometric logratio transformation for compositional data analysis. Mathematical Geology, v. 35, p. 279-300. Martín-Fernández, J.A., Olea-Meneses, R.A., and Pawlowsky-Glahn, V. (2001) Criteria to compare estimation methods of regionalized compositions. Mathematical Geology, v. 33, p. 889-909. Pawlowsky, V. (1989) Cokriging of regionalized compositions. Mathematical Geology, v. 21, p. 513-521. Applying the alr transformation to data in a triad requires that one of the three variables be chosen as the divisor of the other two in calculating the log ratios. Not surprisingly, this well-known asymmetry can lead to different results in the log-ratio graph for each divisor. 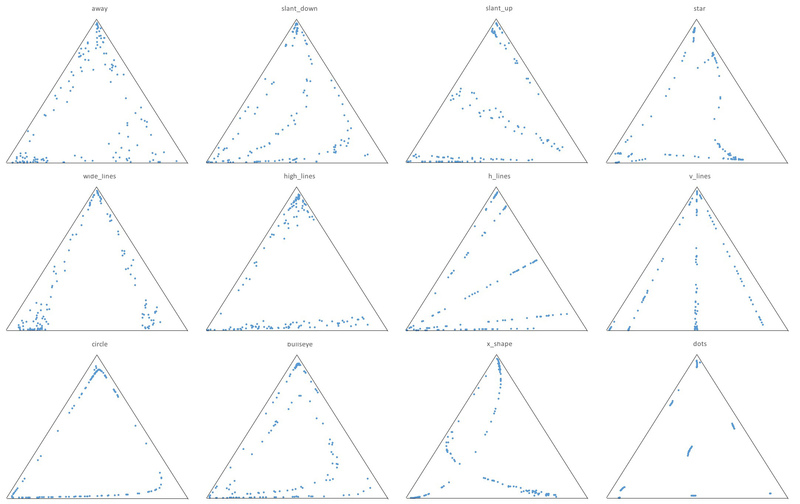 If you’re more comfortable looking at your data in a rectilinear plot than in a ternary, this is probably pretty unsettling. But if you stick with it, something surprising emerges — any computational results that are inverse-transformed back to the originating triad are the same, regardless of the divisor. I bring this up in the interest of full disclosure. I have indeed inverse-transformed some data, but from a supposed log-ratio plot to a previously non-existent ternary. Said differently, I have done at best only the inverse half of what Pawlowsky discussed, and therefore I can’t say that my half by itself is provably permutation-invariant.